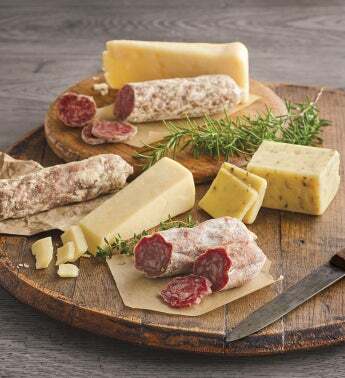 Enjoy this delectable assortment of thoughtfully selected gourmet salami and cheese. Three slow cured Olli Salumeria salami flavors include: earthy Tartufo flavored with truffle oil; fennel-accented Toscano; and apple wood smoked Napoli. They're joined by three artisan cheeses: savory Face Rock Peppercorn Harvest Cheddar; subtly sweet Beehive Cheese Co. Apple Walnut Smoked; and creamy Sartori® BellaVitano Gold®.